Since Mike and I had not eaten lunch yet before going to La Bambache to pick up some macarons, our plan was to grab a sandwich and quiche for lunch. Sadly, they were out of sandwiches so we decided to go elsewhere for lunch. 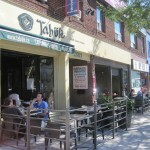 After walking down Yonge street, we came across Tabule and decided to check it out. Tabule has a nice little patio out front but since it was full, we sat inside. The interior of the restaurant was quite dark despite the sun shining in through the windows. Since we wanted to go back to La Bambache afterwards for some dessert, we decided to share an appetizer and a main between the two of us. 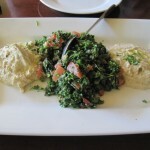 We started with the Sampler Platter which comes with your choice of three cold mezzes for $14. 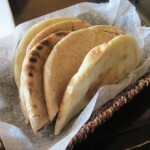 Our first pick was the Babaganuj – pureed bbq eggplant mixed with Lebanese tahini, garlic and fresh lemon juice. 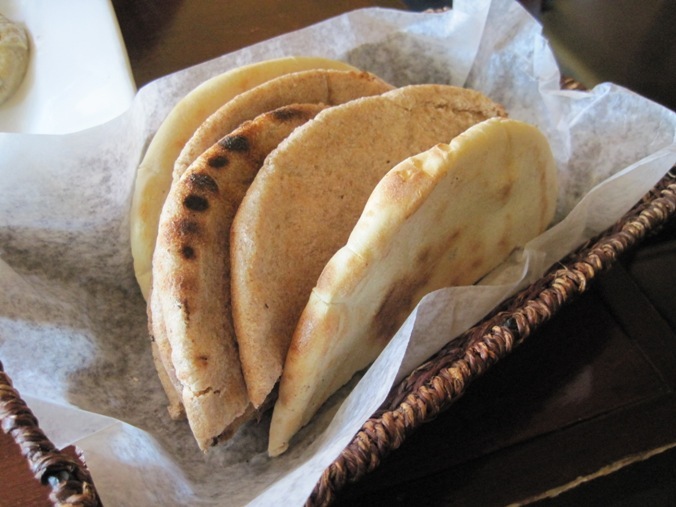 This was an easy choice since we both love eggplant… especially in the form of babaganjuj. Have you ever noticed that there are so many spelling variations of this dish? Just a thought. Anyway, you could really taste the eggplant in this dip and overall I thought it was pretty decent. However, I actually preferred the one at Me Va Me. 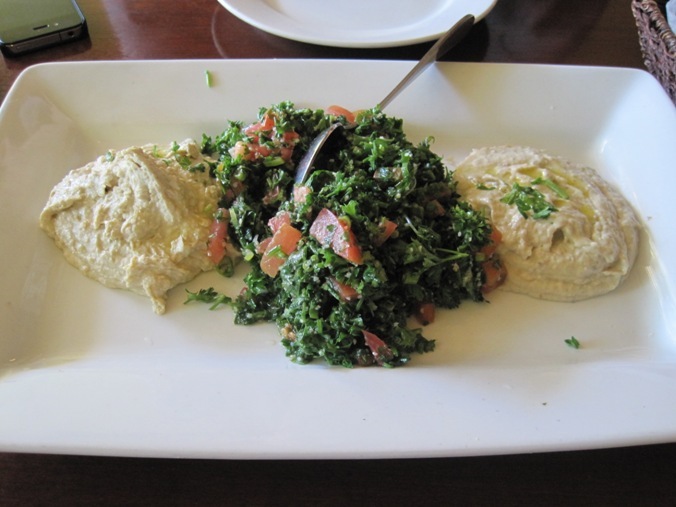 Our second choice was Tabule – freshly cut parsley salad with whole wheat bulgur, tomatoes, onions and a hint of mint tossed in a light lemon and olive oil dressing. 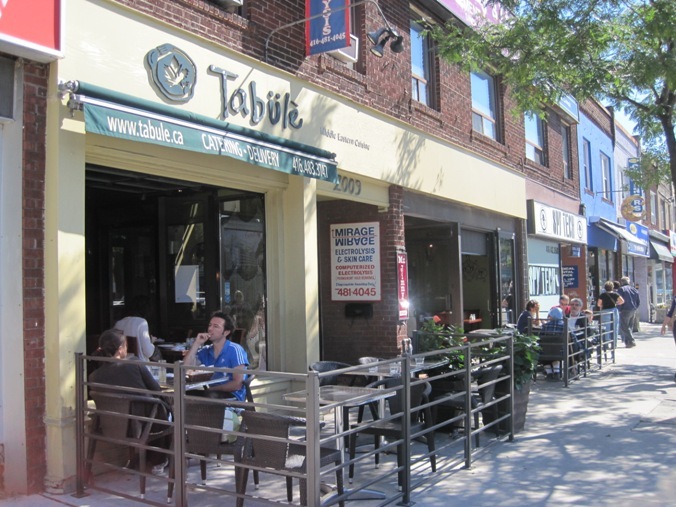 C’mon, you really can’t go to a place called Tabule and not order the tabule. Is it weird that I don’t really like parsley, but I love tabule? Maybe the tomatoes, onions and dressing go a long way. All the ingredients tasted incredibly fresh and I found this to be delicious. Spoonful after spoonful, I finished most of this myself. Lastly, we decided on the Hummus – chickpea puree, Lebanese tahini sauce, fresh lemon juice and a touch of garlic, another classic dip. I only have a bit of this but it’s definitely one of the better hummus’ I’ve had. We were already pretty full after this sampler platter which came with a basket of white and whole wheat pitas. 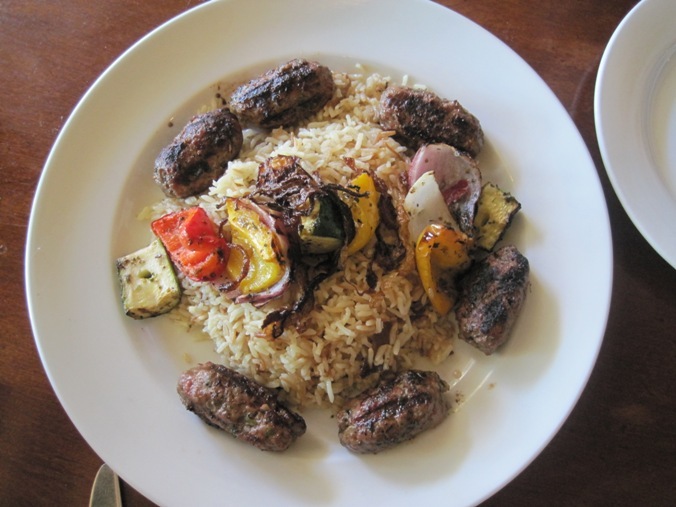 Luckily the portion of the other thing we ordered, the Kefta – two skewers of charcoal broiled ground mixed lamb and beef with onions, tomatoes, parsley, garlic and spices ($14.50) wasn’t too big. This came with six pieces of kefta (aka meatballs). The kefta themselves weren’t anything special. They had a nice flavour but I found them to be a tad on the dry side. 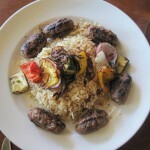 All the mains are served with vegetables and rice topped with onions. This was my favourite part of the dish. Although the rice was a bit oily, it was absolutely delicious and the onions were a nice touch. Even though we were quite full from the sampler platter, we ended up finishing this dish. Overall, the food was pretty solid. The restaurant seems like a popular neighborhood spot as it was pretty busy during our visit and customers kept streaming in. Unfortunately they were very understaffed as there were only two wait staff manning the entire restaurant which made it quite difficult getting the attention of a server. The servers themselves were great though – simply an understaffing issue. I live in the area and have been to Tabule a few times. It’s a great takeout option for when I want something healthy. I find the portions always allow for leftovers which is always a bonus. I bet this place is popular for takeout. You’re right, the portions would allow for leftovers. The two of us only shared a starter and main and were stuffed.